I missed yr post. That's a different one. The Leeds murder was George Anthony Browne 23.12.87 (dob 26.12.57).+pic. Yet oddly there seems to be no press coverage. Hope a passing SL ex officer recalls. Is this corner shop what is now Hyde Park Source Phill? Dog thinks...I'll just nip to t'butchers 'n see if he's got a spare bone or two. Seem to recall a local bad.... murdered round there mid 80's. My sister lived around there in the 80's but I don't remember that? Pretty gruesome stuff.... 80's I'm sure the original "99 steps" were still there as I remember my sister and I using them and counting them on our way back to Kelso Court? I well remember two lots of steps, the '100' as seen earlier with the cobbled slopes between streets, and '99' that I used, with a single continuous flight near enough. There was a 2nd hand shop at the bottom of the 99 steps, I saved up and bought a pair of wooden 'Indian Clubs' hoping to become a 'Charles Atlas' The same row of shops had my first Barber's, he had a polished board that spanned across the chair arms, to save him bending. One of the most evocative photos I've seen of Leeds. A very sobering and sad photo indeed. I wonder if the apparently enclosed area behind the lamp post had a purpose? See the photo on Phill's post on 27-Mar-2014 22:59:17 that is (currently at least) on the bottom of page 1 of this thread. The area is marked on the lower 1908 map in Phill's post on 03-Aug-2012 16:52:51. I think the same has you Phill rose tinted glasses and all that. I think every one looks at there younger years with nostalgia I do when it comes to Hunslet just about every thing gone such a lively place when I was young. Not sure of the exact date Jogon. The guy Eric is very good in letting people re-post the photos on facebook and other places. I think he's a bit surprised at the amount of interest shown in them. To him at the time they were only snap shots I guess. But they've proved to be an excellent record of an era long since gone, and the photos are good quality in colour too. I don't think he is from Leeds, so it was possibly when he was at Uni for a year or two. All the photos appear to be in the same time frame. Judging by the buses and bus crews uniform it was when Leeds City Transport was still in operation. So the photos are no later than 1974. Great Link Phil, a lot of the photos are from the area I grew up in LS4/6. 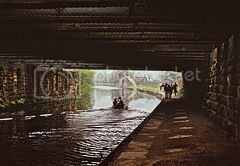 Smashing photo of the railway bridge over the canal at Armley.